Vggiegirl, so many kudos to her for sharing this recipe! 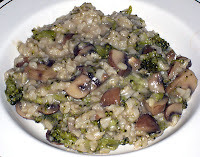 I used brown rice instead of wild rice, because it's what I had on hand. And, I used scrumptious baby portabellas and canned cream of mushroom soup--though I will most definitely try the vegan recipe for the soup the next time around.